Crest's Oral-B line offers several rechargeable Electric Toothbrushes. The Oral-B Electric Toothbrushes use an oscillating-rotating movement that is proven to cut down on two times more the amount of plaque than a manual toothbrush. Crest's Oral-B Electronic Toothbrush line has four different types of series to choose from including Sonic Technology, Vitality, Professional Care, and Professional Care Smart Series. The Sonic Toothbrush provides 27,000 vibrations per minute, which make teeth whiter and healthier. It's thin precision bristles and two customized brushing modes promote a high level of cleanliness. 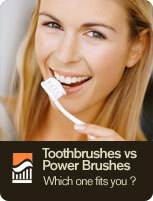 The Vitality Electric Toothbrushes reduce plaque-causing gingivitis with help from the dual moving brush head. The special movement can also remove stains and discoloration, leaving teeth feeling fresh and clean. The Professional Care Series brushes have dentist-inspired cupping action, which gets each individual tooth extremely clean. These Electric Toothbrushes remove up to 97% of plaque, and naturally whiten teeth within twenty-one days. The Professional Care Smart Series is Oral-B's most advanced cleaning technology for optimum plaque removal. It's deep clean mode removes up to 99.7% of plaque. After three weeks, you will see your teeth have been significantly whitened and polished. These Electric Toothbrushes run from $40 to $200, with replacement brush heads costing $10 to $30.